Flotation belt provides stability for cardiovascular exercise and core strength. Includes everything you need to get started with water fitness: Shape Pro Buoyancy Belt, DeltaBells, AquaRunners RX, Getting Started DVD, Water Workout Guide and an optional Blue Carry Bag. Belt sizing chart available here. Includes everything you need to get started with water fitness: Mens Pro Buoyancy Belt, DeltaBells, AquaRunners RX, Getting Started DVD, Water Workout Guide, and an optional Blue carry bag. Includes everything you need to get started with water fitness: Shape Buoyancy Belt, DeltaBells, AquaRunners RX, Getting Started DVD, Water Workout Guide and an optional Blue Carry Bag. Includes everything you need to get started with water fitness: Fit Buoyancy Belt, DeltaBells, AquaRunners RX, Getting Started DVD, Water Workout Guide and an optional Blue Carry Bag. Includes everything you need to get started with water fitness: Classic Buoyancy Belt, DeltaBells, AquaRunners RX, Getting Started DVD, Water Workout Guide and an optional Blue Carry Bag. This versatile AquaJogger features features a fold over design that fits the AquaJogger into a 12" by 12" by 3" space. Packs easily in your workout bag or suitcase. Stores in your gym locker or car trunk. Ideal for women with wider waistlines or who are pregnant. The Shape is longer on the sides and shorter in the arch to distribute buoyancy evenly. Colours available. Belt sizing chart available here. Ideal for men with wider waistlines. Designed for those who need more buoyancy, "sinkers". Shape Pro is 30% more buoyant than the Shape Belt. 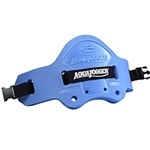 The AquaJogger Pro Belt is ideal for men or athletes with more muscle mass. This belt has 30% more buoyancy than the Classic. Ideal for "Sinkers"-- men or athletes with more muscle mass. The Pro Plus Belt has 50% more buoyancy than the Classic Belt. The AquaJogger Classic Belt is a great all-around belt for most average body types, average shaped women or lightweight men. Its patented arch design engages core muscles. The AquaJogger Fit Belt is ideal for short-waisted, petite, or athletic women. Tapered sides provide a better fit for narrow waists. A great belt at a great value, the Active is our most economical model. Belt has a non-elastic web belt and does not include video. Features a fully adjustable nylon belt to hold the Water Runner securely and comfortably at waist.